In this “back-to-basics” article, we will look at a basic building material, tool, and weapon- one that can be used for shelter, a tool handle, walking stick, and the most basic and primitive weapon. As a weapon, the more-or-less six foot staff is one of the most universal among many martial arts traditions, and often the first taught. Shaolin, Wing Chun, Kobudo and other schools of martial arts teach staff “forms”, or choreographed practice sequences that have been passed down through the ages. For basic utility, the staff can be used to carry firewood and water (by hanging bundles or buckets at the ends and carrying over one’s shoulders), and for other forms of transport (such as game, strung up between two people; or to craft a sled or skid). Sturdy poles can be used to build tripods, lean-tos, and other structures you might need around camp. 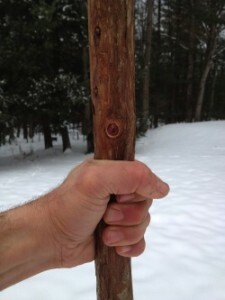 A staff can also be used to make a spear or whittled down for a tool handle. There are many articles online regarding various types of survival staffs that are basically types of walking sticks, perhaps of lightweight material, that have chambers to hold objects for survival. There are many clever designs. I do like the idea of such staffs, but wonder how well they will hold up. For this article, we are discussing the primitive staff. It might seem a very simple subject, but there are many considerations worth becoming familiar with, including wood selection, crafting tools and handles, building possibilities, self defense, and weapon-crafting possibilities. At my campsite in the Catskills there were White Pines (Pinus strobus) and Hemlock (Tsuga canadensis) saplings about 10 years or so in age and thick enough to block visibility and make walking difficult. Besides other considerations regarding location, it seemed fitting for a campsite to clear the thick trees that were already shading each other out. 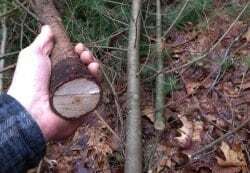 Small trees a few inches in diameter can be easily cut with a hatchet, camp saw, or machete. They provide material for building structures and for other craft. The unused material dries relatively quickly to provide future kindling and firewood. Plus, depending on the species of trees being felled, food and medicine can also be gleaned. In the case of White Pine and Hemlock the needles and bark can be used to make “tea” for medicinal use, pleasure, or as a nutritional supplement. Many tree barks have medicinal uses and sometimes leaves or other parts are also useful as food or medicine. Once felled, the branches can be removed from the saplings with a machete or hatchet. A small saw can be useful. I also like to have pruners in my pocket and some loppers nearby. Though more time consuming to use, such tools can more cleanly remove branches if desired. I like to leave interesting branches and crotches in case they are useful for some project later. But for the most part the idea is to work the sapling down to a relatively uniform building material. After the branches are removed the poles can be organized by size. This process gives you lots of material to work with for shelter building and the like. You might consider removing the bark while the saplings are still green. For one thing it is easier to remove than when it dries to the trunk. You also may want to use it for making rope, baskets, and the like. It can be used as lashing for certain things right away. You probably can’t get nice sheets of bark from small trees such as you would want for bark baskets, but the possibilities with even small strips of bark are many. In some cases you will be able to find a stand of smaller trees that died from being shaded out. The wood might still be good quality. The Cedar (Juniperus virginiana) pictured is good quality even though it died as taller trees outgrew it. A primary use of a staff is as a walking stick. My first mentor in the world of wild edibles and survival skills, Taterbug Tyler, used to walk with a garden hoe that had been cut down to just a small triangle left of the blade. He claimed that he once saved himself from falling over a ledge by grabbing onto a tree root with the hoe. Mostly he used it as a walking stick in the rugged territory we hiked through looking for Ginseng (Panax quinquefolius). The blade came in handy for unearthing roots and flipping over rocks. It is a good tool and could be reproduced with the natural form of a hardwood staff. Another use for a staff as a walking stick is for crossing streams. In certain territory you might have many streams weaving around, or you might need to repeatedly cross a stream that you are traveling along. Even if you find logs and rocks to help you cross, a staff can help you maintain balance. Without rocks to cross on a staff can be used like a pole vault to help you jump across what you otherwise could not. For these reasons, it is useful to carry a staff. I am fascinated with the bo staff and like to go with just over six feet as a standard cutting length. Particularly when Hickory (Carya spp.) 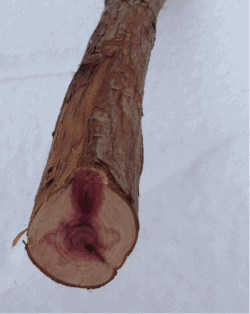 or some other hard wood is found, it is an ideal size for a weapon as well as to begin making a bow or spear. When cutting the trees down and into length, look for nice straight six-foot sections. It is generally good to cut the trees where they bend in order to preserve straight sections and removed the crooks. The staff has been a most basic striking implement since ancient times. Needing to use a weapon against wildlife is an unlikely scenario, but not impossible. Certainly, it could make you feel better to have some protection in hand. There has been more than once when the sound of coyotes or something unknown has prompted me to pick up a stick. Better yet is the feeling of knowing how to use it. Most people should be able to wield a staff should an emergency arise and be able to perform basic strikes to protect themselves. With training, the staff becomes an increasingly useful weapon, with several distinct benefits: there are reasons otherwise to keep it at hand, it is superb blocking instrument, any part can be used as the handle, and it can be used for a variety of strikes to virtually any part of the body. It can be swung with great momentum. It can strike low or high, as well as both in relatively rapid succession, and one can thrust with the end of the staff with the potential for damaging penetration. 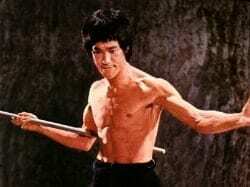 For these reasons, the staff is a primary weapon of many styles of martial art. Kobudo – the martial art of the Okinawan weapons (which is often integrated with Karate), Shaolin Kung Fu, Wing Chun Kung Fu, Ninjitsu and many others have their study of the staff. Learning the forms, or kata, of these arts is a way to learn special combat moves. Becoming proficient with these moves not only makes the weapon more effective, but provides a healthful exercise that improves balance, coordination, circulation, immunity, and awareness, all of which are important in a survival situation. Plus, study of the forms could provide a pastime during life in the wilderness. 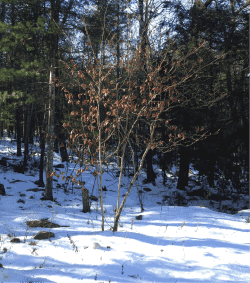 When selecting a location to set up camp one should consider finding a nice stand of relatively young trees or saplings that can serve as a source of materials. Your lean-to could be positioned centrally to reduce expenditure of time and energy. Of course, you also want to consider exposure to sun and other elements. In the part of the world where I live you generally want your lean-to opening toward the south to increase sun exposure in cold seasons. If there is a strong prevailing wind you will want to put the back of the lean-to toward it. You can also look for suitable trees to support a lean-to before you chop them down. Of course, when gathering trees for utility, one should consider the various types of wood and their pros and cons. Generally, hardwoods are prefered. “Hardwood” usually refers to deciduous trees, even the softer ones. And “softwood” refers to conifers, which are usually softer than hardwoods (though soft hardwoods are softer than hard softwoods). Hemlock and Pine are both softwoods. Particularly White Pine is soft. Although both softwoods, Hemlock is much harder than White Pine. 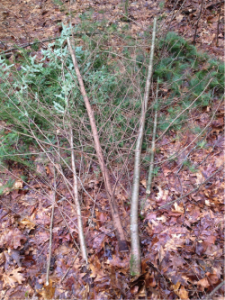 The White Pine saplings that are staff size (naturally or whittled down) are quite weak. They have certain uses, but would break far too easily under any significant weight or force. White Ash (Fraxinus americanus) has a low moisture level, even when green. My freshly cut staff looked stouter than it felt, compared to the heavier woods (Witch Hazel, Iron Wood, Hickory…) I had been working with. 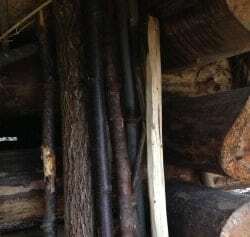 Regarding bushcraft, one advantage of a lower moisture percentage wood is that building materials have less time to rot. If you are planning to turn the bush into a campsite there is a good chance you’ll be using some green wood. If you are building with green wood, there is a good chance for mold to develop as the wood dries out. Thick, heavy, damp wood will dry out much slower than something light like Ash. In fact, Ash has so little moisture that it can be burned green. As we all know, the drier the better. The survivalist, however, should be aware of the low moisture content of Ash in the event of finding no dead wood. Perhaps green would might be a better choice than soggy logs from the ground. Regarding a staff, Ash has the interesting benefit of being lighter. So, the strength of a green stick with the weight more of a dry one. Ash is the primary wood for baseball bats as it has strength but receives the vibration. Although not nearly the strength of Hickory, Ash is used in much the same way for bows and tools handles. The bushcrafter should be aware of the various kinds of woods, including their benefits and weak points. Although the basic staff (or bo) seems simple, it’s uses are many.